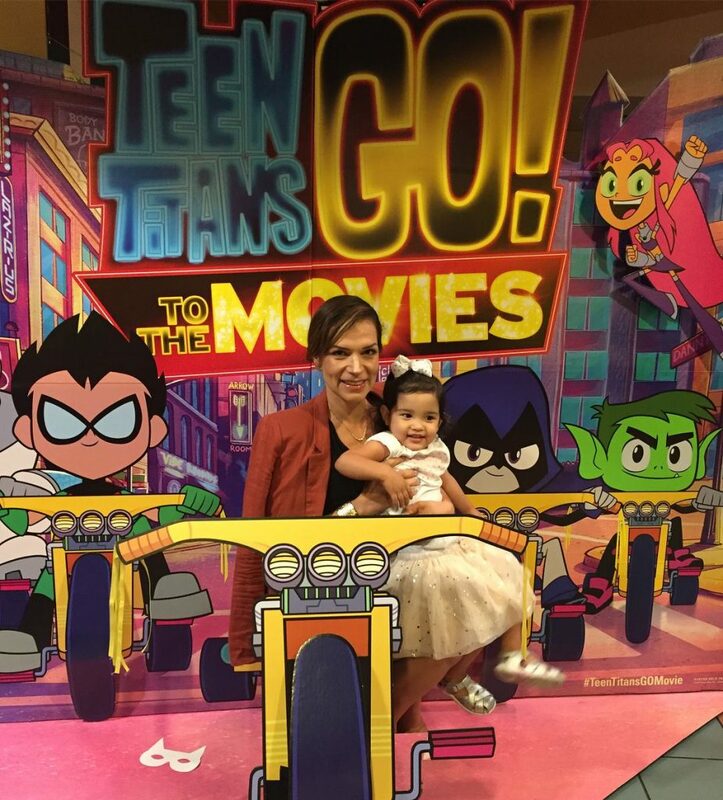 Earlier this week, I went to see the preview screening of the Teen Titans GO! To The Movies film. I must confess I was not very familiar with the Teen Titans GO!, but as soon as I mentioned the movies to my nephews, they filled me in and were looking forward to seeing the movie. Teen Titans is an American superhero animated television series, based on the DC characters of the same name. 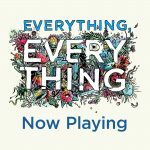 The movie includes the characters from the show and is hilarious! It is not often that a movie surprises me. 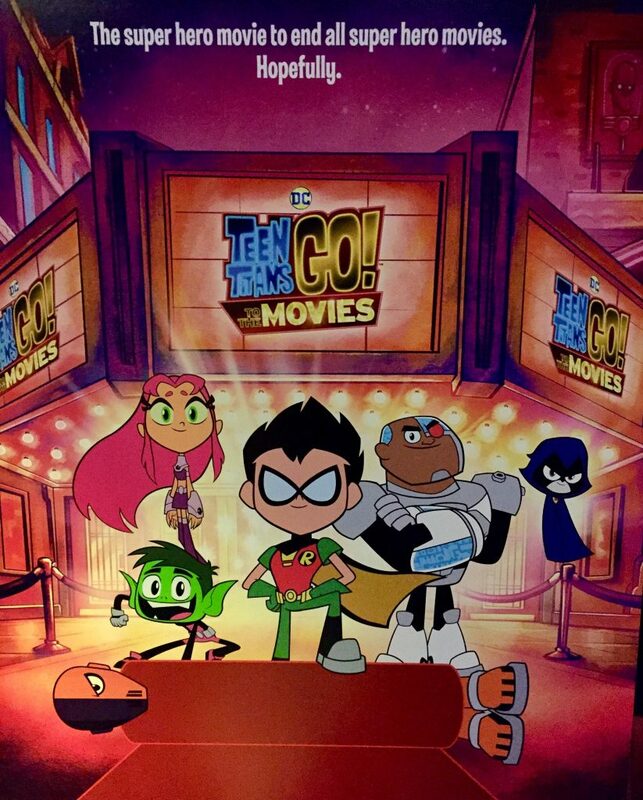 I expected to watch a movie about superheroes, Teen Titans GO! To The Movies is about superheroes, but these are very special and funny superheroes, not your traditional superhero characters. 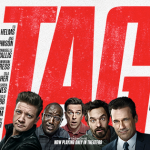 The movie has several jokes which may be relatable to parents which grew up in the 80’s or 90’s. It has music from several famous films and lots of jokes about other well-known superheroes. The movie also includes roles by the better known superheroes, such as Superman, Wonder Woman, and Batman. As the mother of a girl, I think it is positive for young girls to see women in superhero roles. Teen Titans includes two female super heroes, Raven and Starfire. It also includes Robin (from Batman & Robin), and two other male superheroes, Beast Boy and Cyborg. I don’t want to spoil the movie for you by giving too much of the storyline away, but it was very funny! I heard several parents laughing during the movie, of course the kids laughed as well. The story line also has a positive message about team work, loyalty, friendship, and helping others because it is the right thing to do, not only to receive recognition. 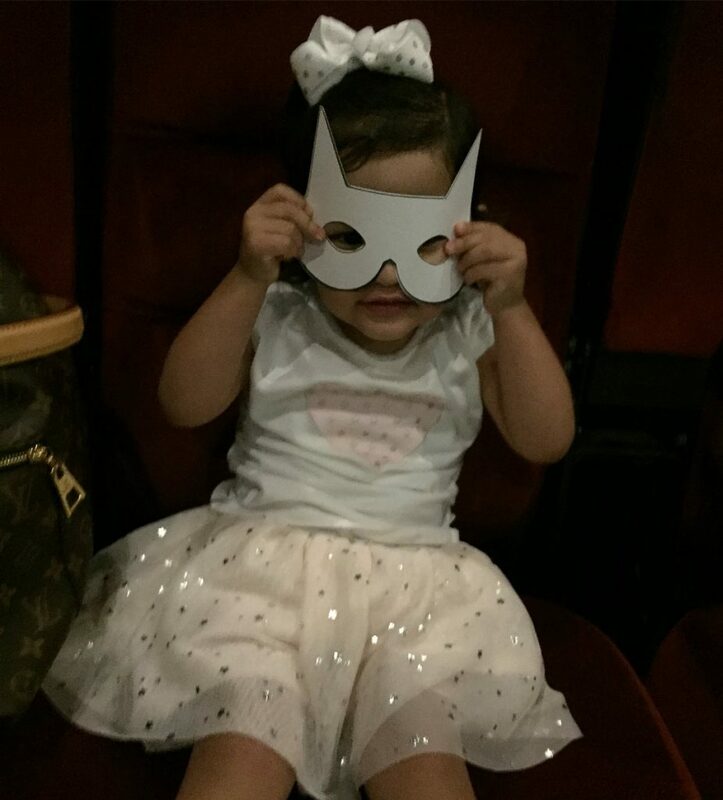 My daughter, Alessandra is two and I wasn’t sure if she would sit through the entire movie, but she did! She was attentive and said several “wows” throughout the movie. During certain parts with music, she would dance as well, which of course I found cute. My sister and nephews (age group 6-10) joined us for the movie and they liked it as well. I enjoyed the movie so much, that the time went by fast! Below are some ideas for a Teen Titans GO! themed party. 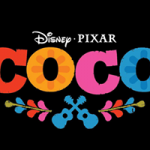 You could have a party with your children and their friends (plus parents) before going to watch the movie as a group. 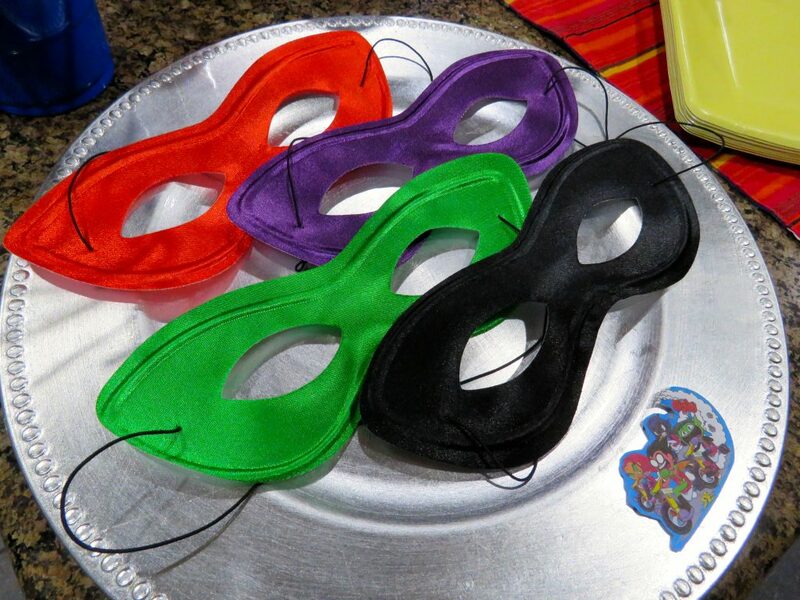 Or, if you add a cake and/or piñata, you can use these ideas for a Teen Titans Go themed birthday party. 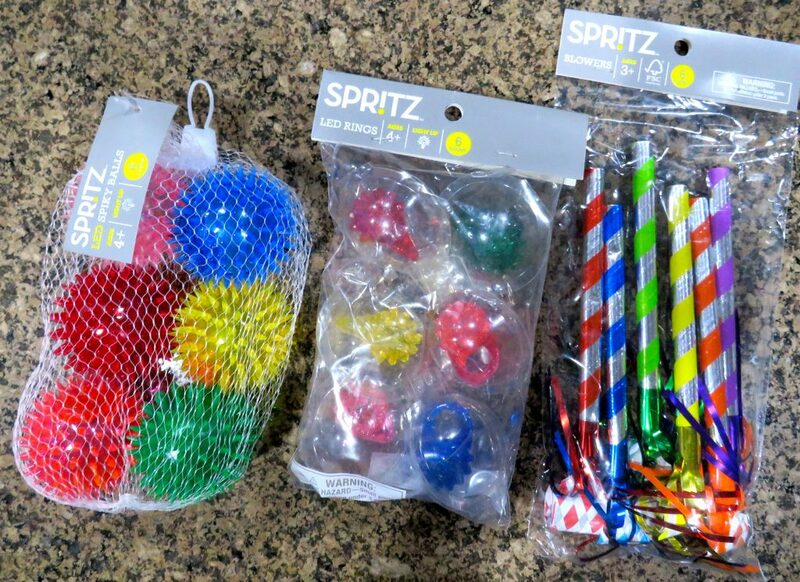 If you want to have a summer party, simply add water balloons and games, or have it at a pool! Even though Teen Titans GO! 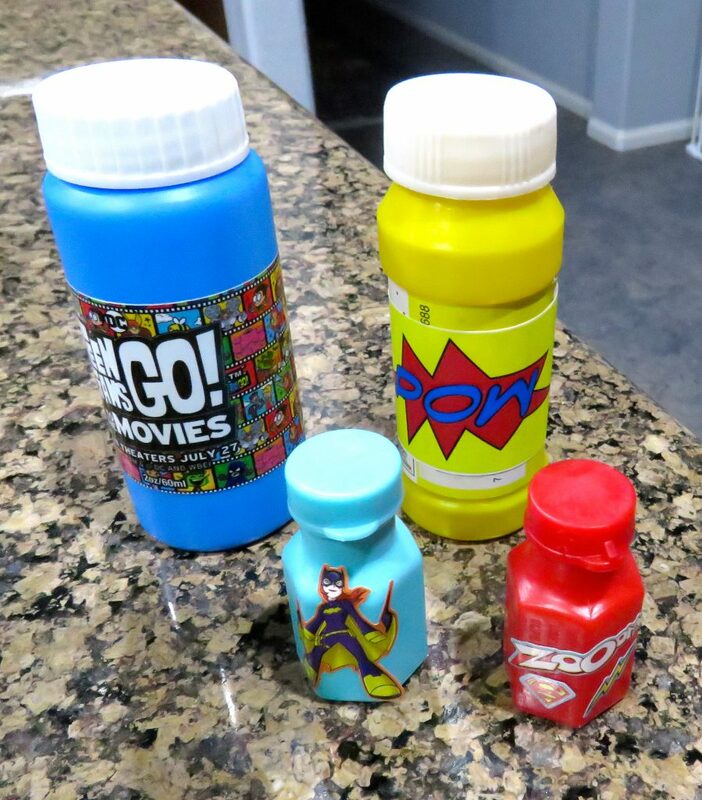 is a popular television series, it wasn’t easy to find themed items at Target or Walmart stores. Party City, where I often buy party items, did not have any Teen Titans Go! items at the store. So, I had to get creative and a bit crafty to come up with decorations and items for a themed party. 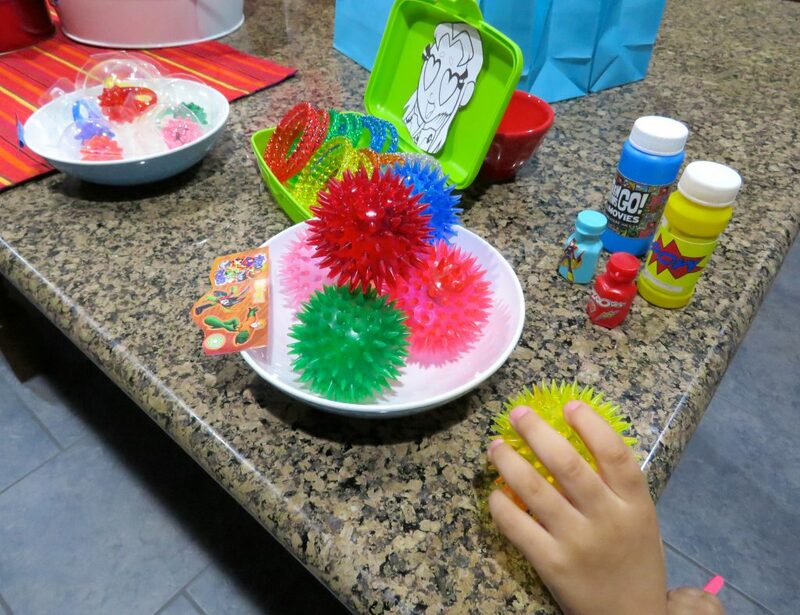 I purchased several items at Target and Party City, and also used some items we had at home. 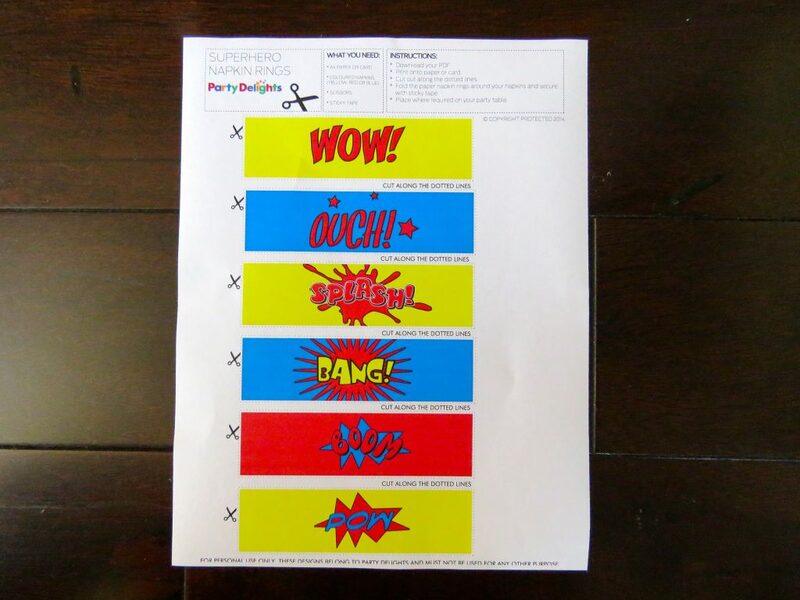 I found ideas on Etsy, Pinterest, and some free printable superhero themed graphics on-line at PartyDelights.com. There are several Teen Titans Go! 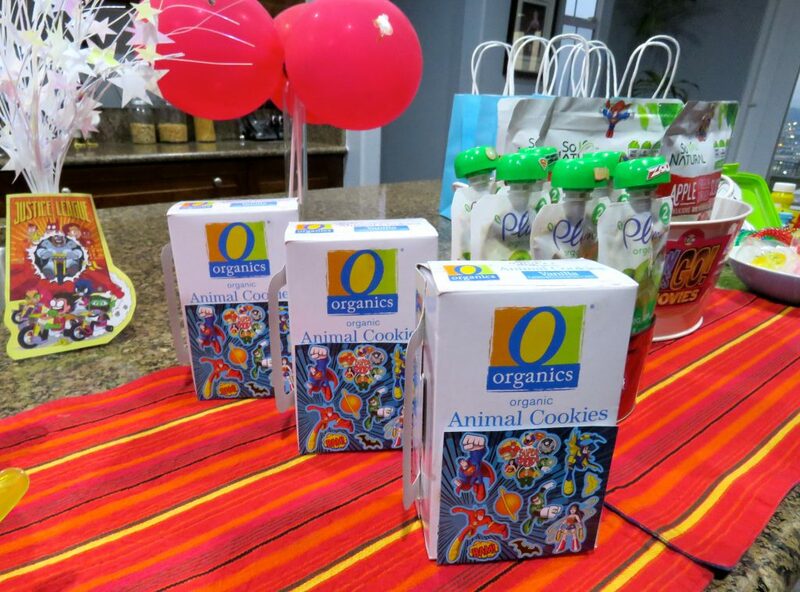 themed party supply packages you can purchase on-line. 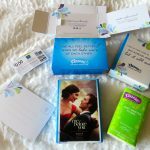 I Googled it and several options came up, but I didn’t have enough time to wait for a delivery because I wanted to post these party ideas along with my movie review before the movie opens this Friday, July 27. 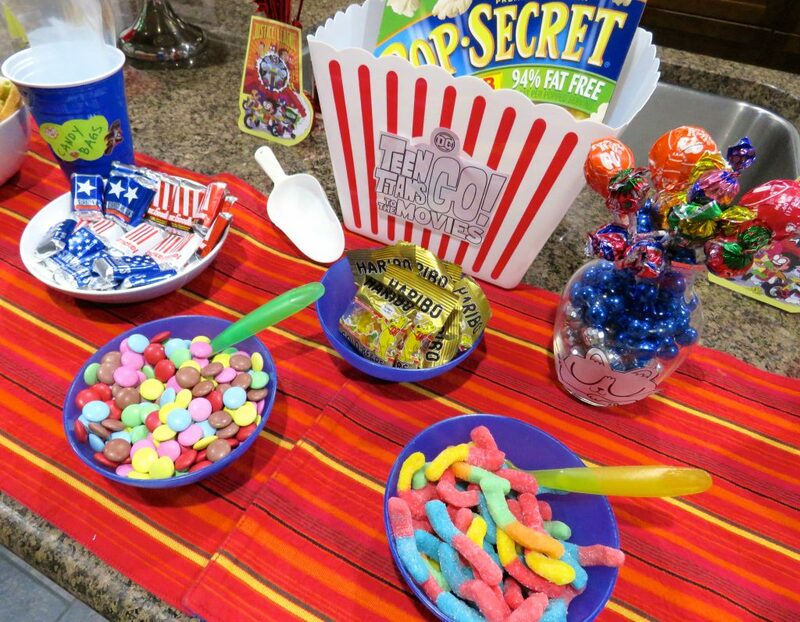 I hope you like these ideas and have a party, even if it’s just for you and your kids before heading to watch the movie! It will make the movie night experience even more memorable! Teen Titans GO! To The Movies opens in theaters this Friday, July 27. 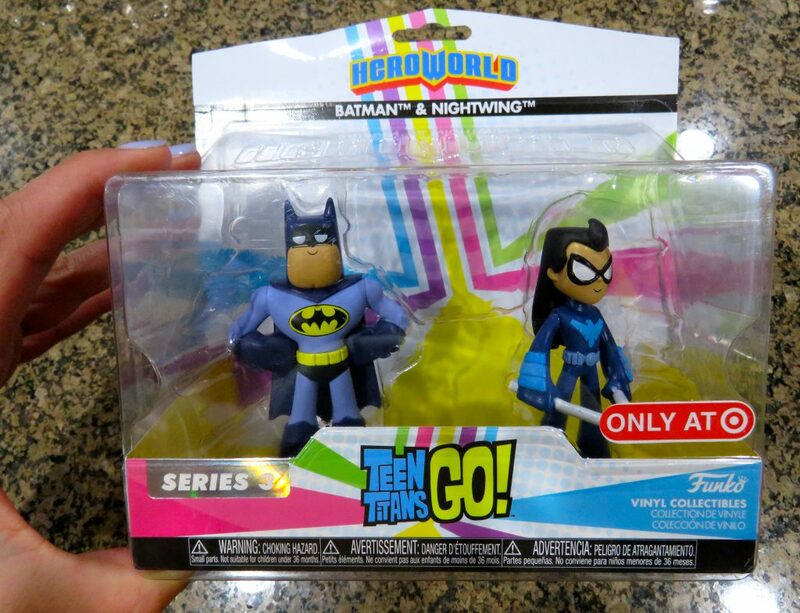 You can find more information and tickets at Teen Titans GO! To The Movies. I included the movie trailer below, as well as some pictures from the preview movie screening we went to earlier this week. 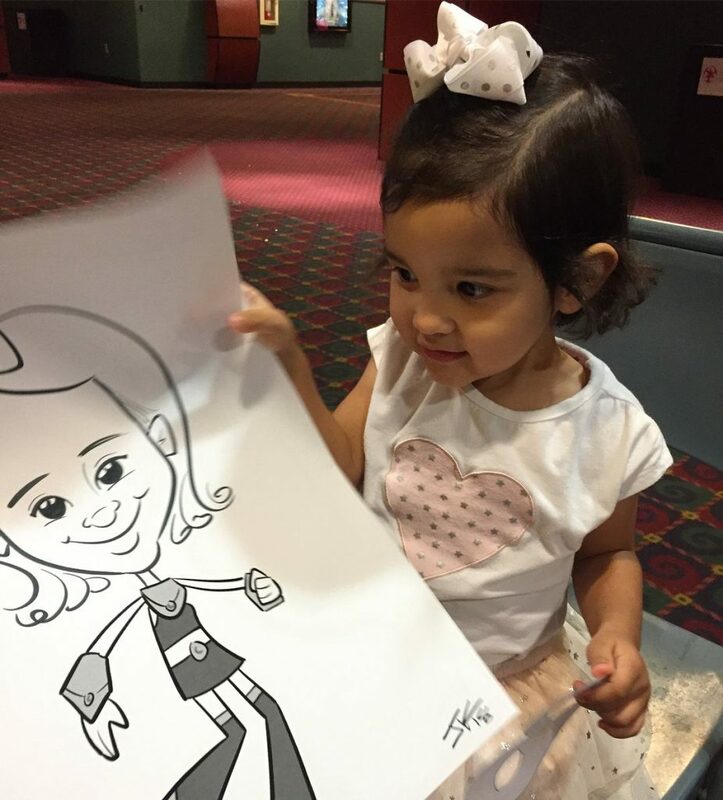 We had a fun time at the movies! 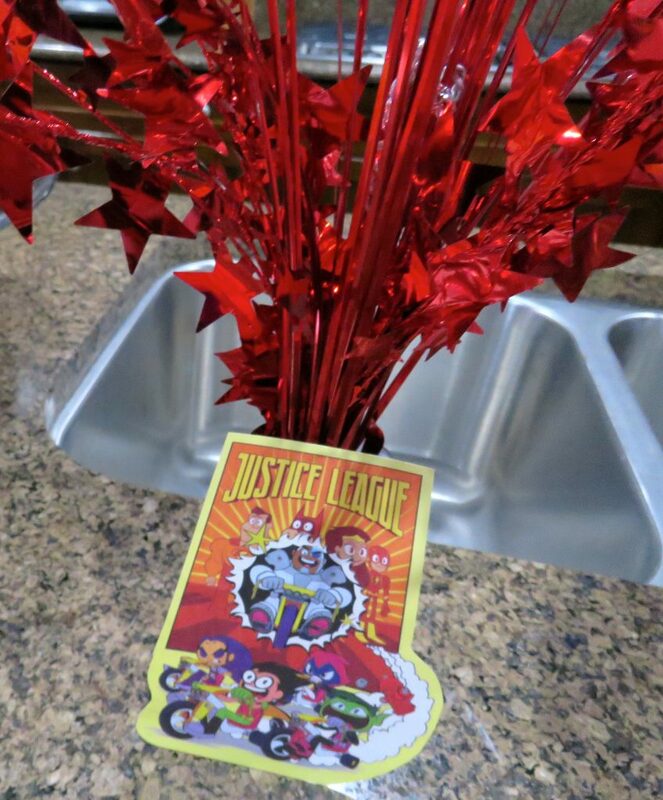 *I was invited to this movie screening by Allied Integrated Marketing and some of the party supplies were provided by them. All opinions are my own. The following are ideas for a Teen Titans Go! Theme Party! 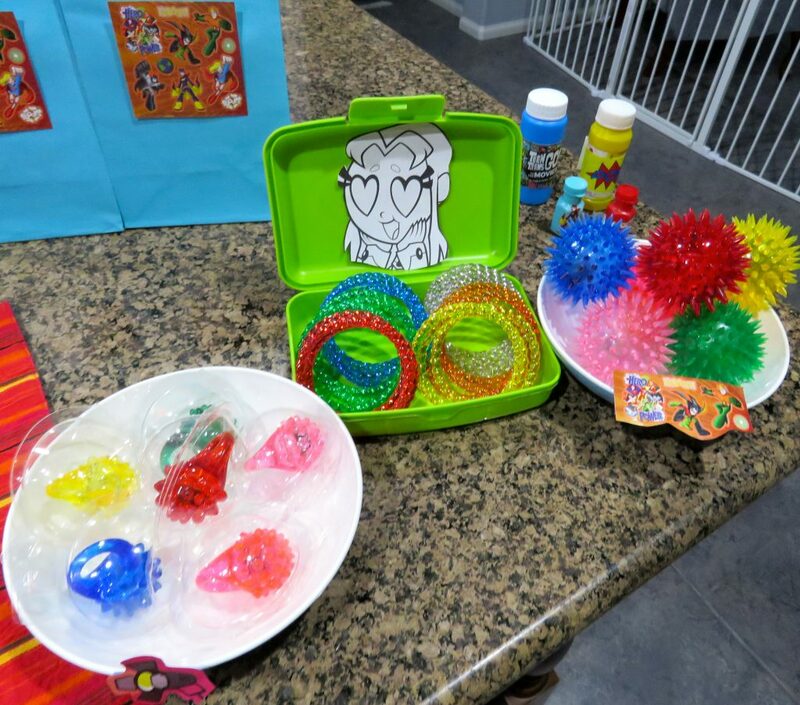 I made notes regarding where I purchased the items and some of the do-it-yourself decorations which I made. 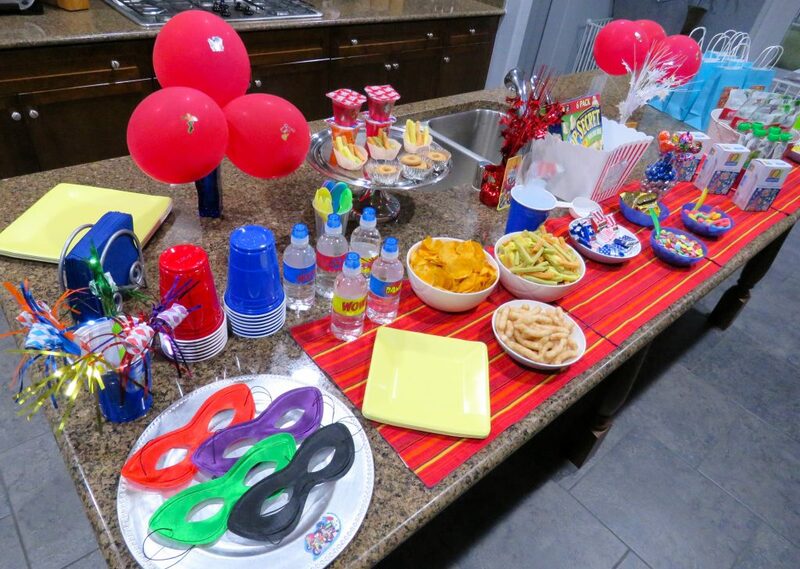 I set-up the party food and items on our kitchen island. For most of our parties we set-up the food here because it is also next to the family room and has close access to the back yard. The theme colors for this party were bright tones: red, blue, yellow, and purple. I used red table setting place mats and lined them together to form a colorful runner with the theme colors. 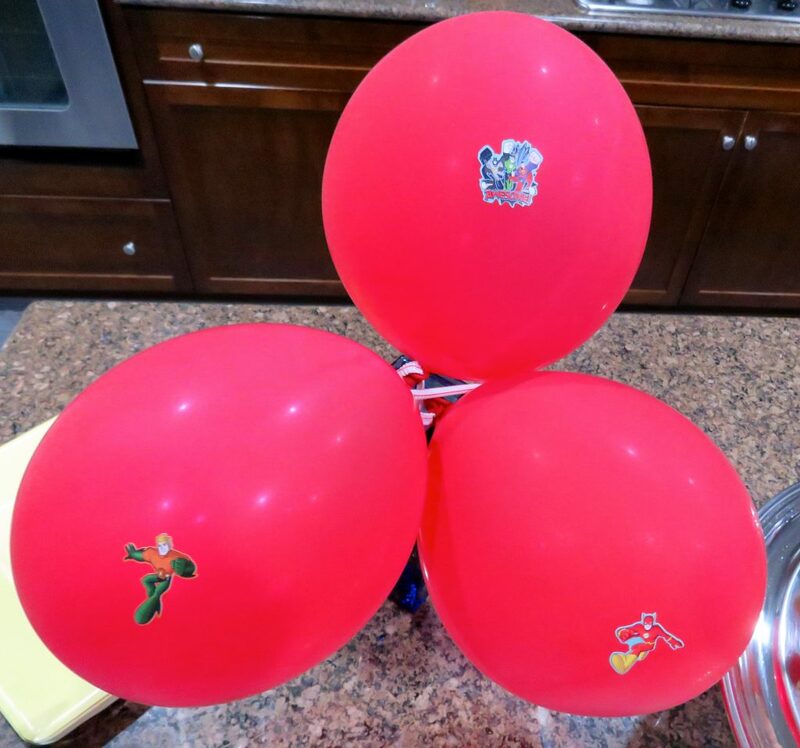 I decorated with red balloons and added some superhero stickers. 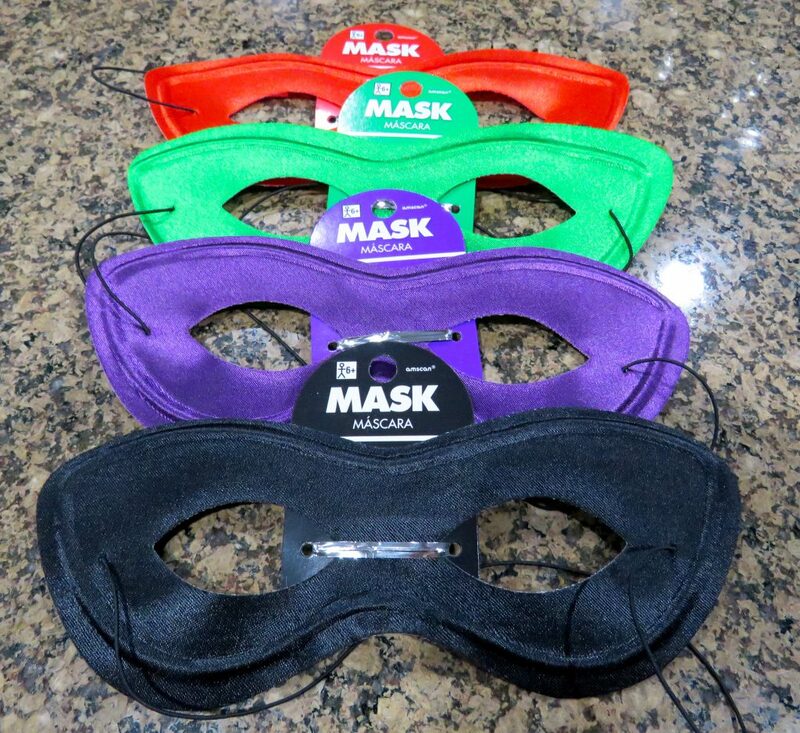 Masks for guests to wear and take with them after the party. 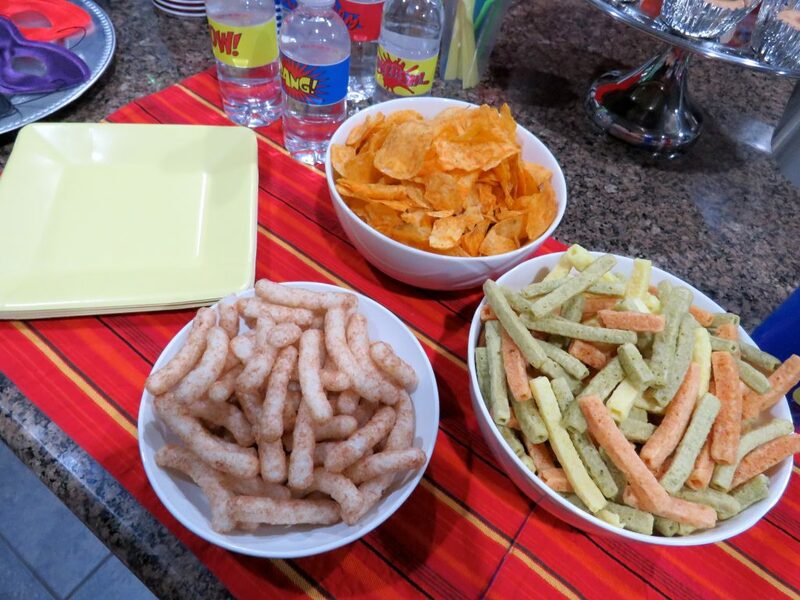 Snacks and chips. 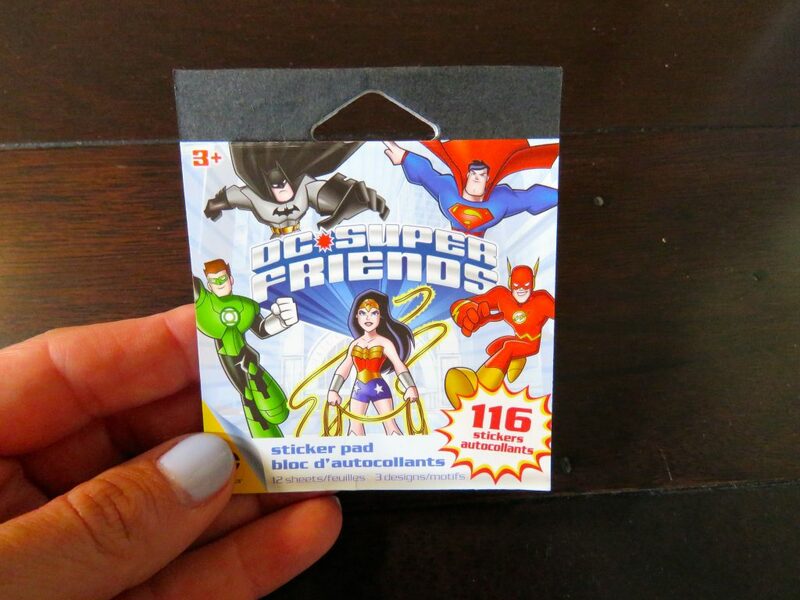 I added superhero stickers to the jello packets. A candy section with bags for guests to fill on their own. 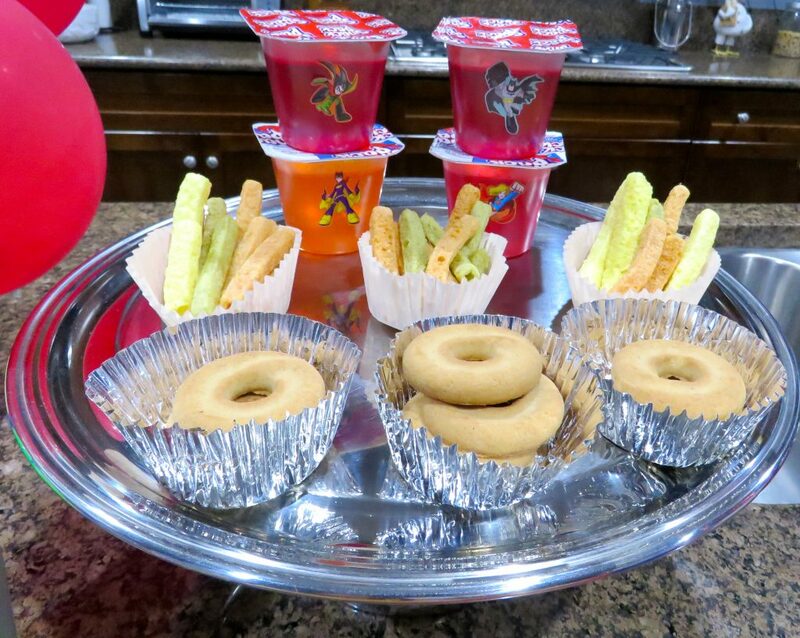 Snacks for guests to eat at the party or take with them, if we were to head to watch Teen Titans GO! To The Movies at the theater after the party. 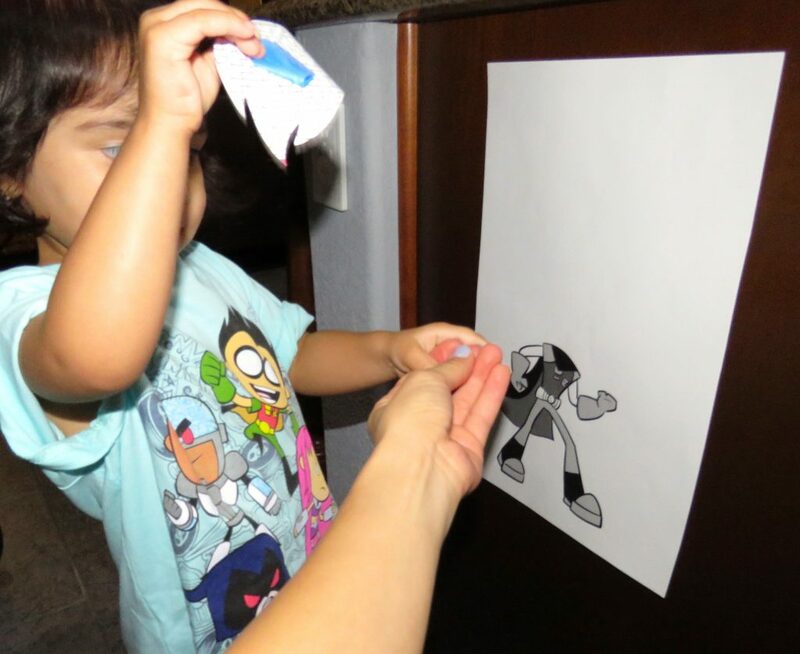 I added superhero stickers and taped on Teen Titans GO! signage which I cut from a coloring sheet I got at the movie screening. Teen Titan signage and stickers can be found/purchased on-line (I Googled it and found several options). 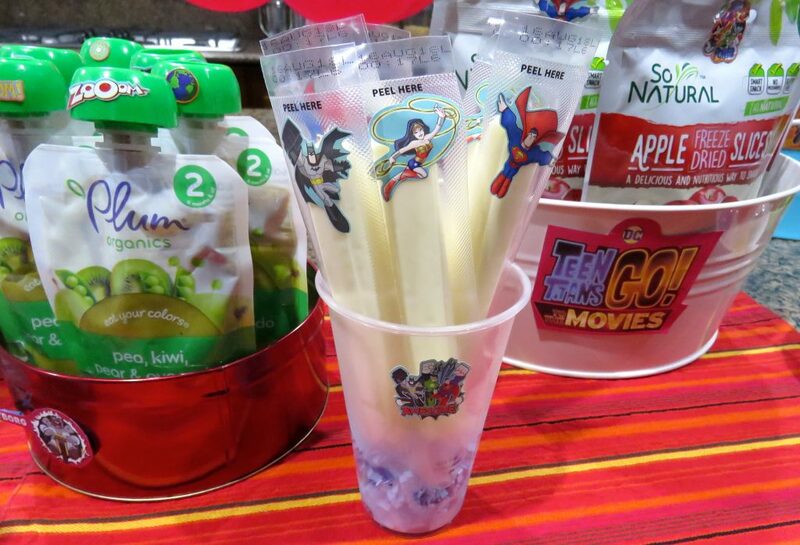 I added superhero stickers to string cheese sticks. I kept the cheese in the refrigerator until it was ready to be served. 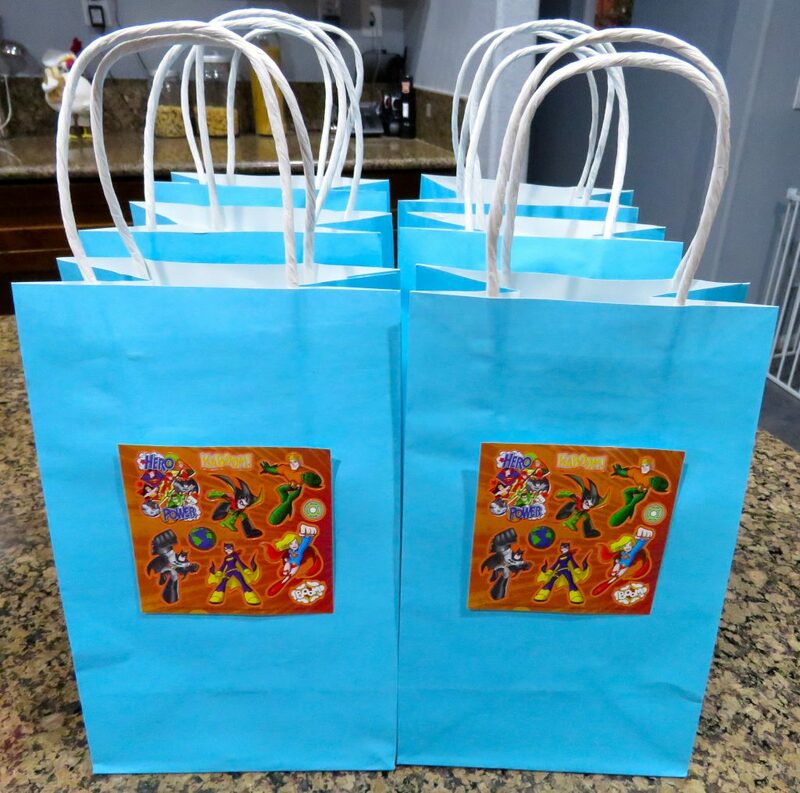 Bags for the treats: Instead of selecting a sticker for each bag, I used painter’s tape to attach an entire sheet of stickers, this way the kids could enjoy using the stickers at the party or at home. Small toys for the kids to play with and take home. 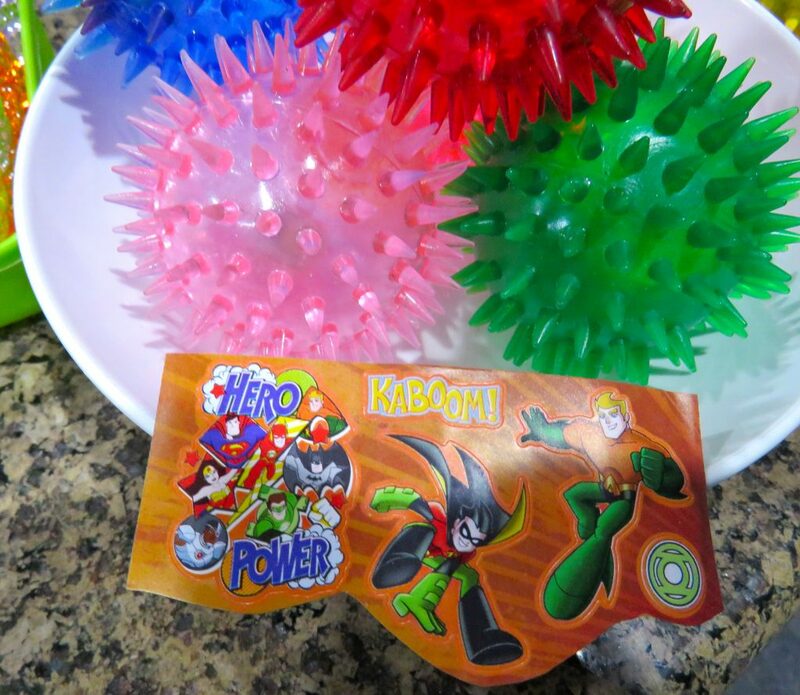 The rings and balls have LED lights and the spikes reminded me of the superhero theme. 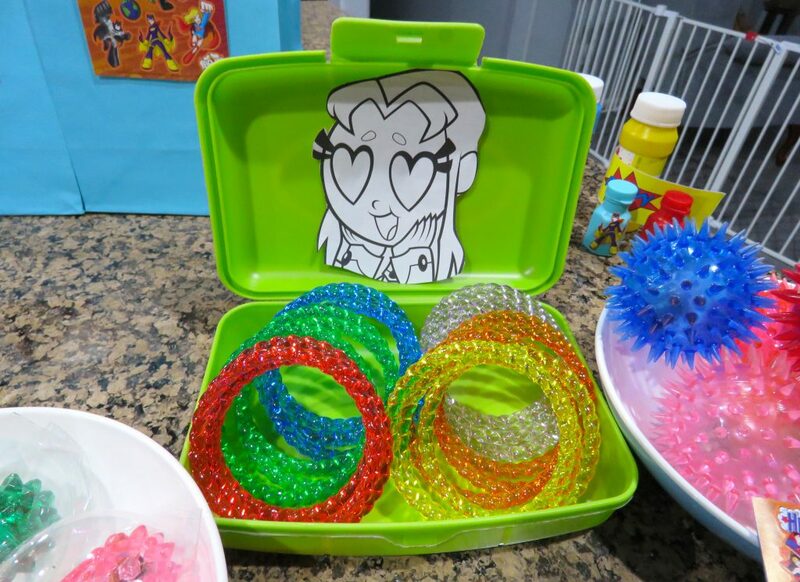 I used one of my daughters storage boxes as a small jewelry box to place the bracelets, which are also on theme with the party colors. I cut out a caricature of Starfire to decorate it. I added a row of stickers to decorate the bowl with the LED balls. The toys looked so great that Alessandra couldn’t resist playing with them. We got a container to make bubbles at the movie screening and I added a few more for the party. I added stickers to the small containers and one of the bottled water labels to the larger container. 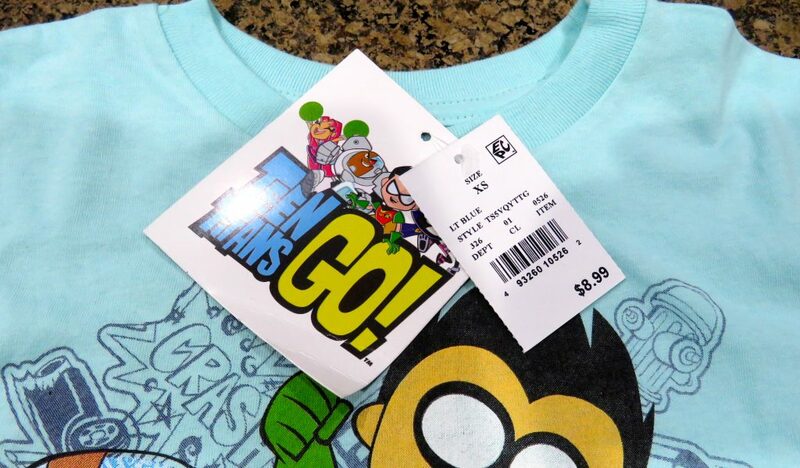 I purchased this Teen Titans GO! t-shirt for Alessandra at Target (size X-small, she is two and the shirt was a little big on her, it may fit better on a three or four year-old). She loves the shirt and was excited to wear it! I matched it with purple leggings, also from Target, and her silver Stride Rite leather sandals to go with the superhero theme. 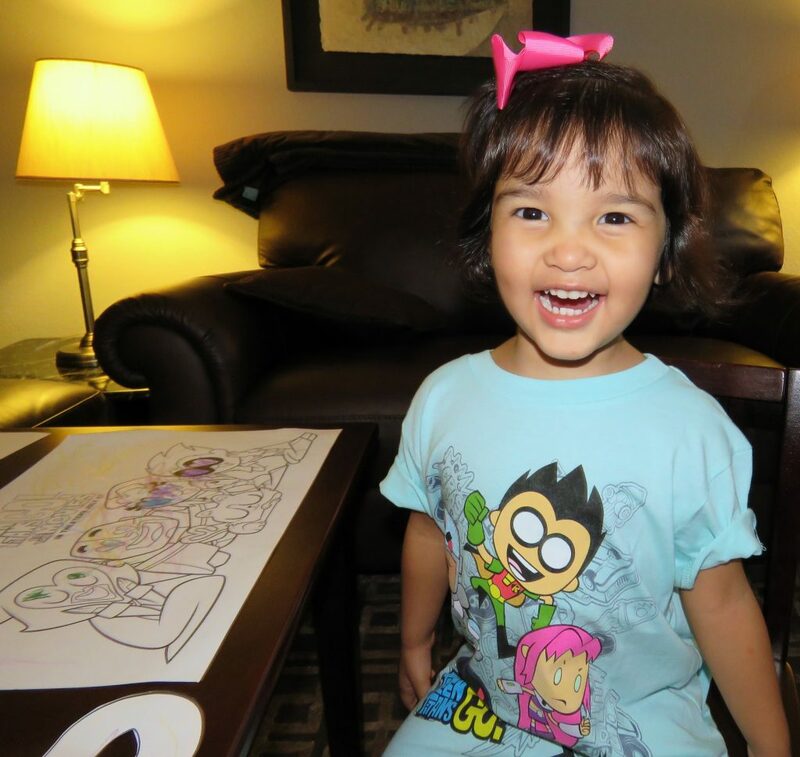 I set-up a coloring area for the kids on Alessandra’s small table in the family room. 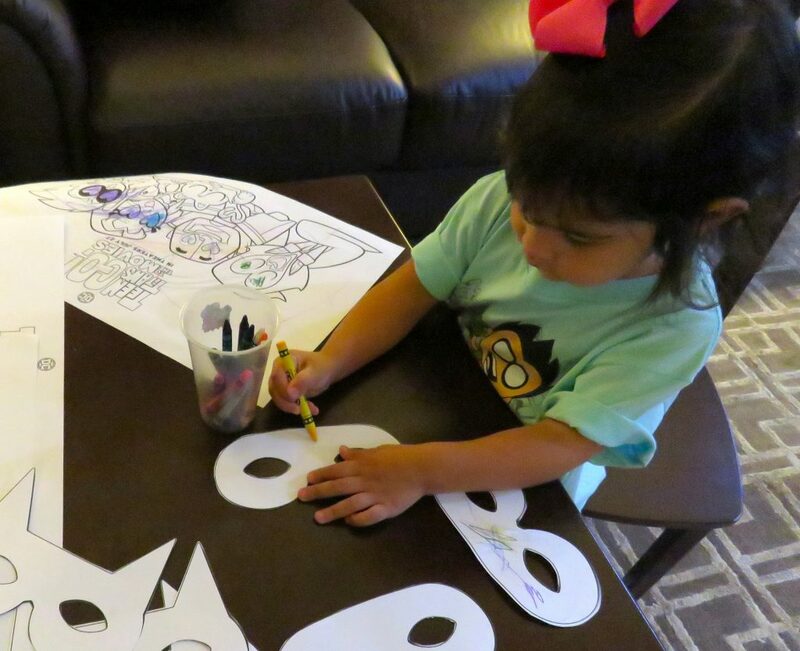 I got the idea for the masks from the movie screening and also got the coloring sheets at the movie theater. 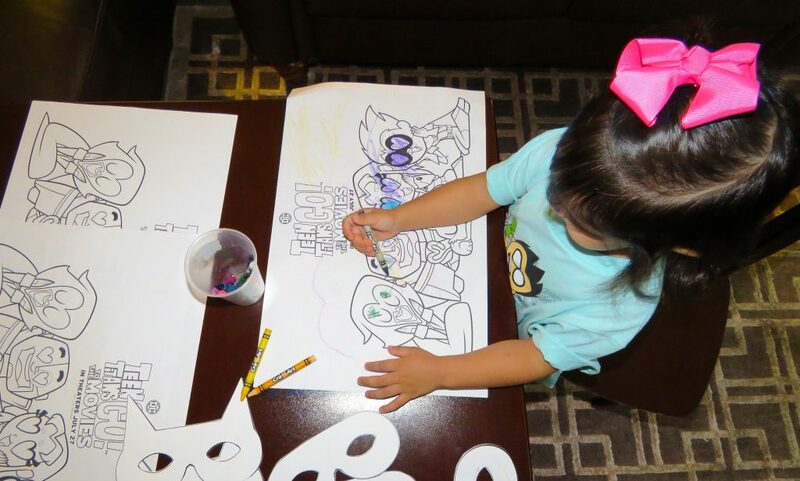 You can find coloring sheets on-line. 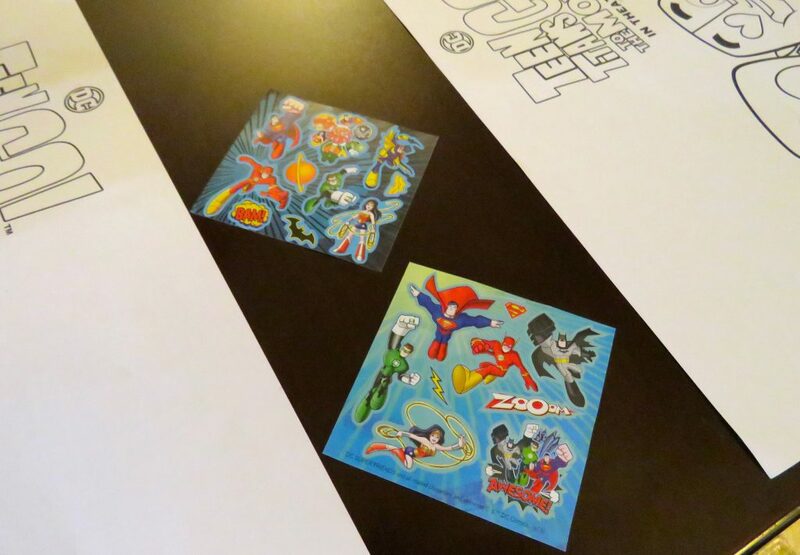 I placed a few superhero sticker sheets on the table in case the kids wanted to use them to decorate their masks, or put them on their clothes or hands. 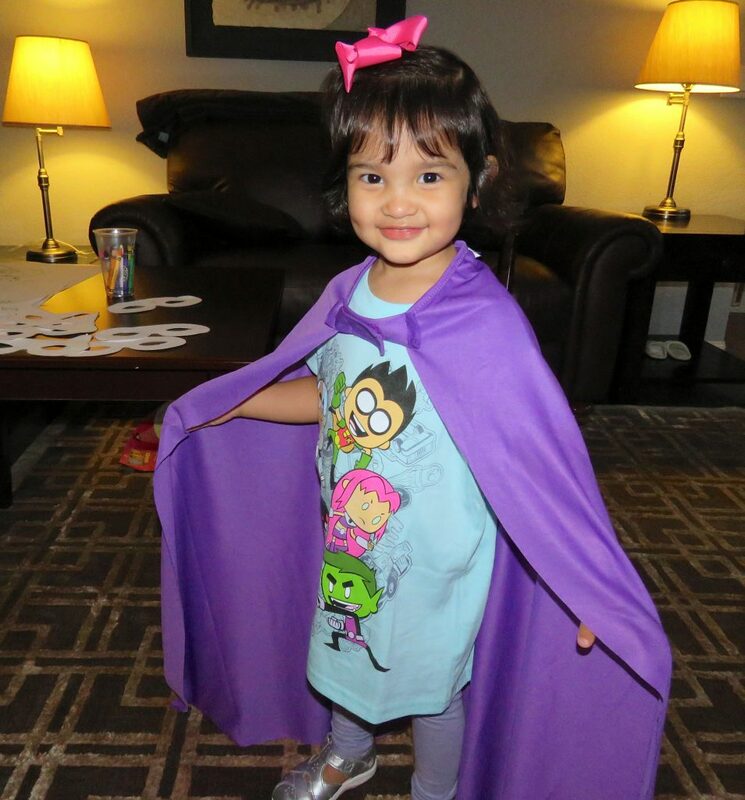 I purchased this purple cape for Alessandra at Party City. It is made to fit adults and kids. It was a little long for her (fit her down to her heels), but can easily be cut at the hem to fit younger children. 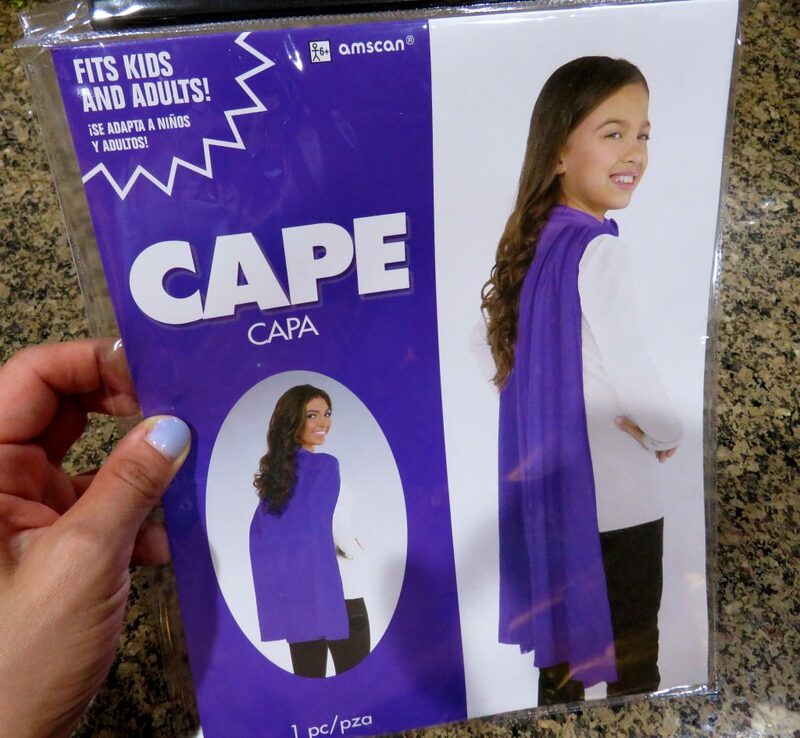 Capes were available in multiple colors. 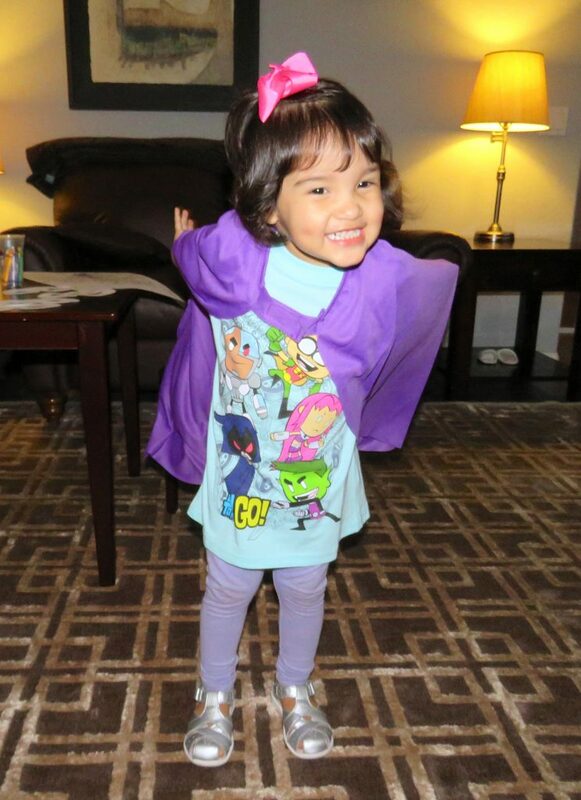 When she put on the cape, she started to pretend she was flying, like the Teen Titans GO! fly in the movie! So cute! 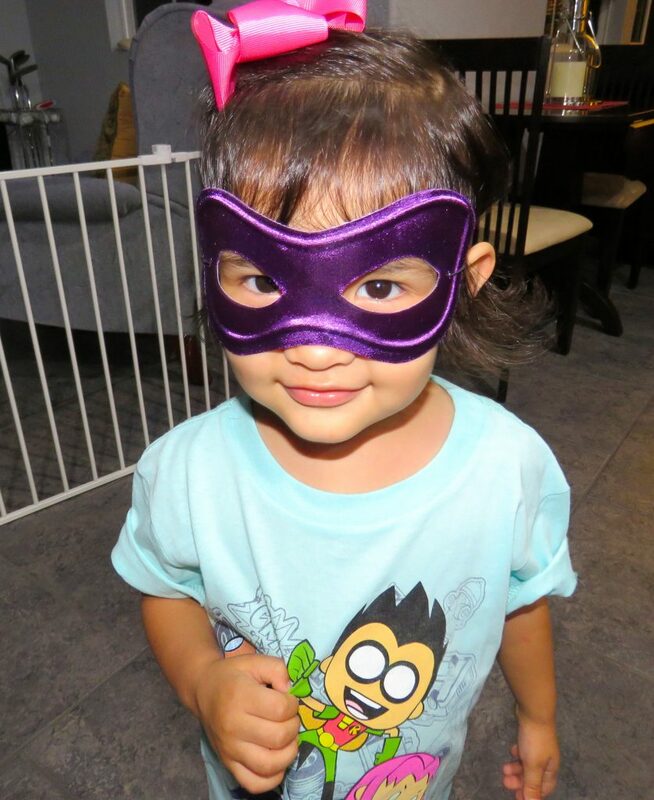 We also played with the colored masks. 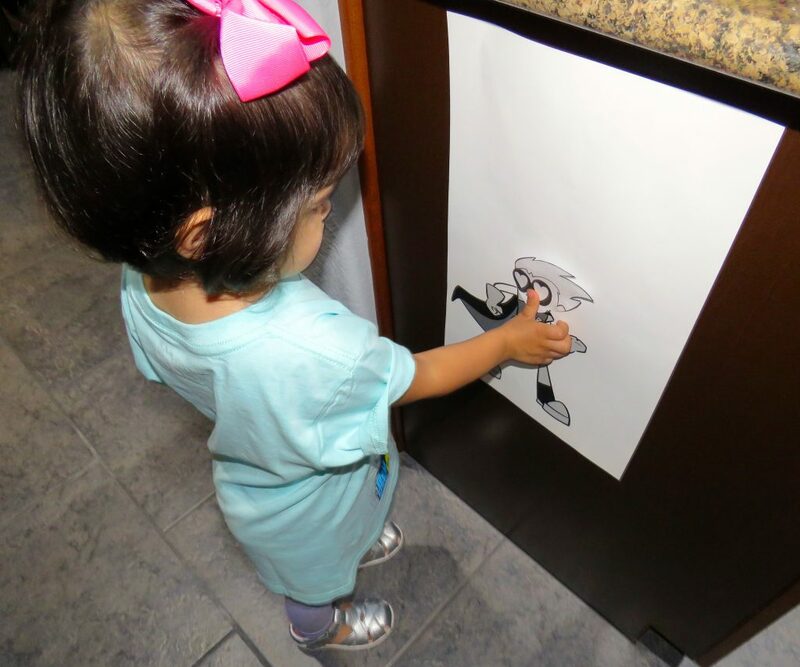 I got one of the blank Robin drawing at the movie screening and cut out a Robin head from the coloring sheet to create a Pin The Head on the character game. I used painters tape on the back of the head so it could be removed easily and re-attached by the next child participating in the game. 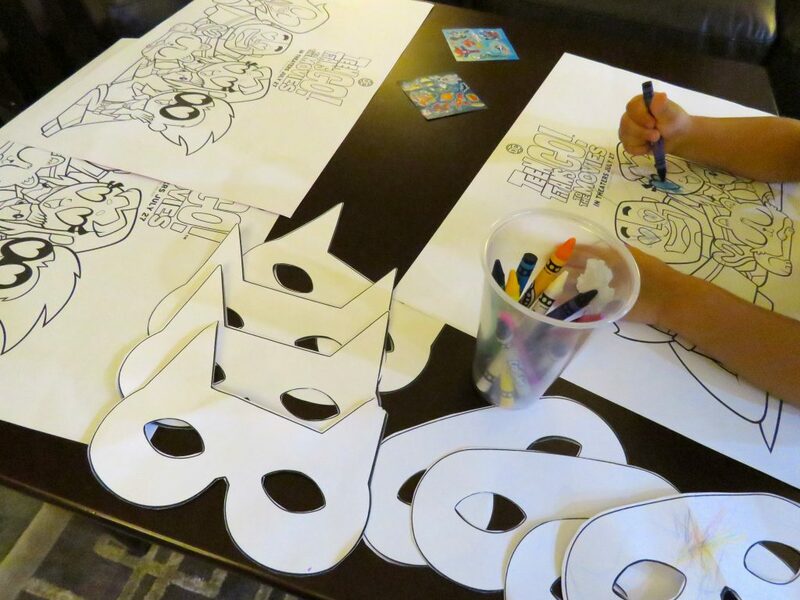 You could also make copies of the sheet for kids to color and draw their own head or make copies of the Robin caricature head for each child to participate in the game. 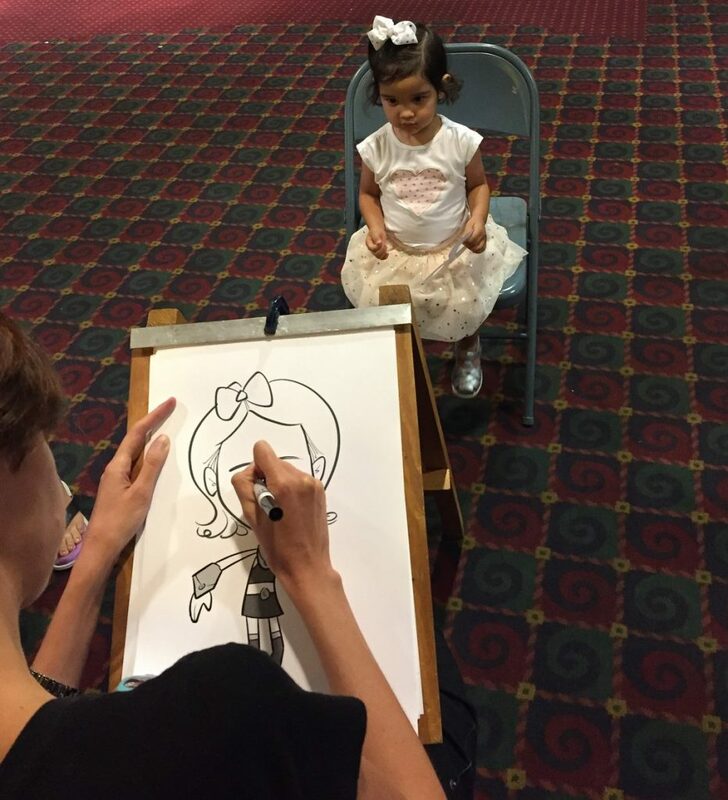 At the movie screening, there was an artist paining quick caricature heads of each child on the sheets (see picture of Alessandra’s drawing above). 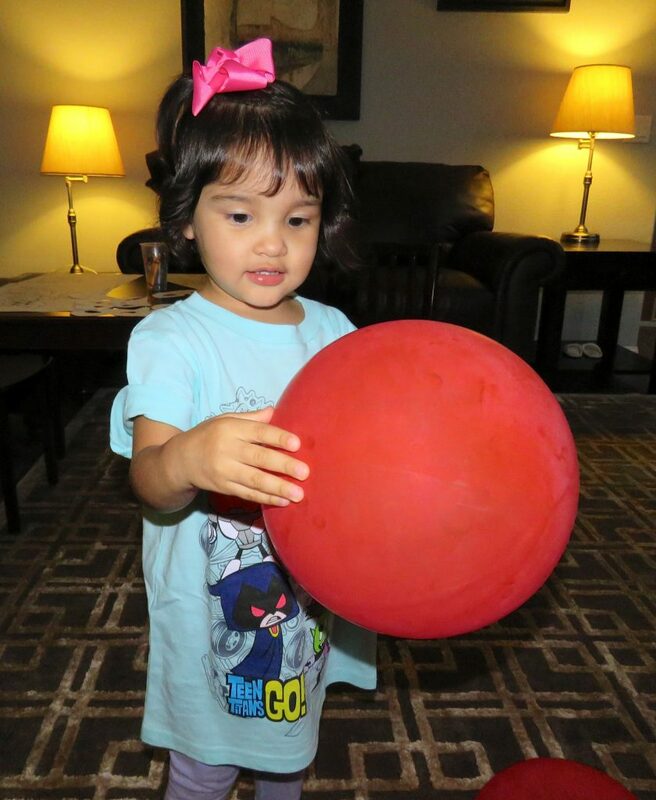 Alessandra had fun playing the game. 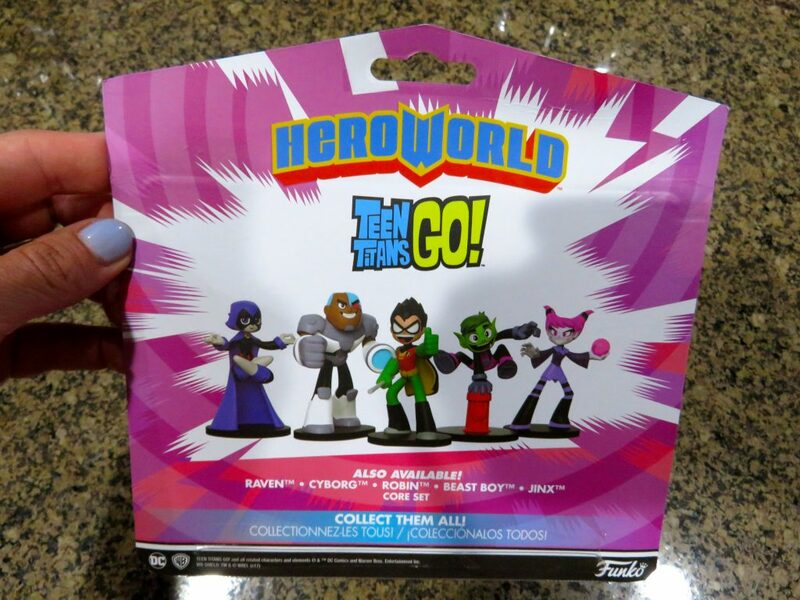 I purchased this set of Teen TItans GO! collectible figures at Target to use as a prize for the game. The collectible figures are also available in these characters. 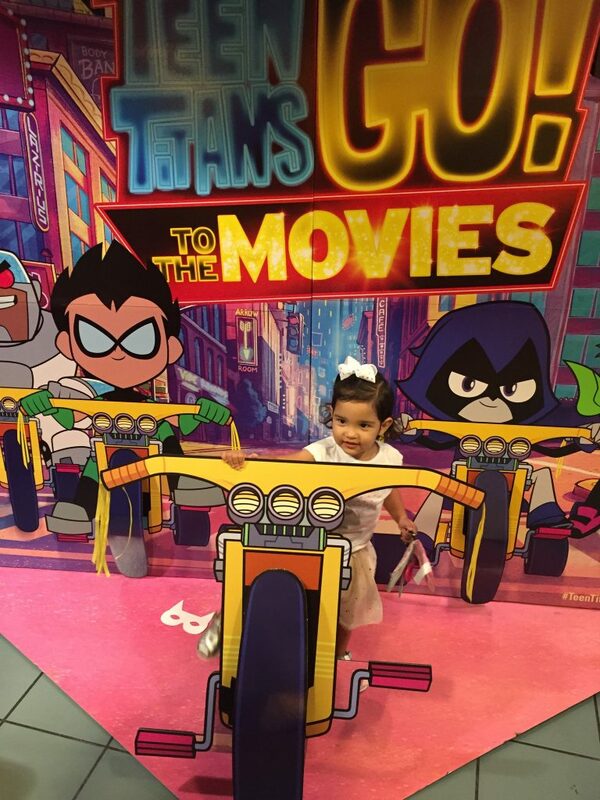 In the movie, the Teen Titan GO! characters ride on big wheel style tricycles. Alessandra doesn’t have a big wheel, but she does have a tricycle. I used a cut-out caricature of the characters from the coloring sheet and attached it to the front of the tricycle with painters tape. 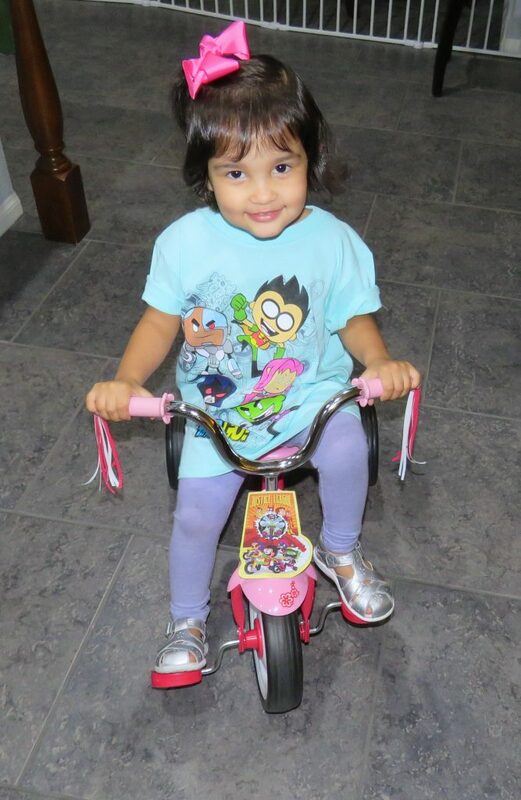 She liked the addition of the caricature on her tricycle & had fun riding on it. 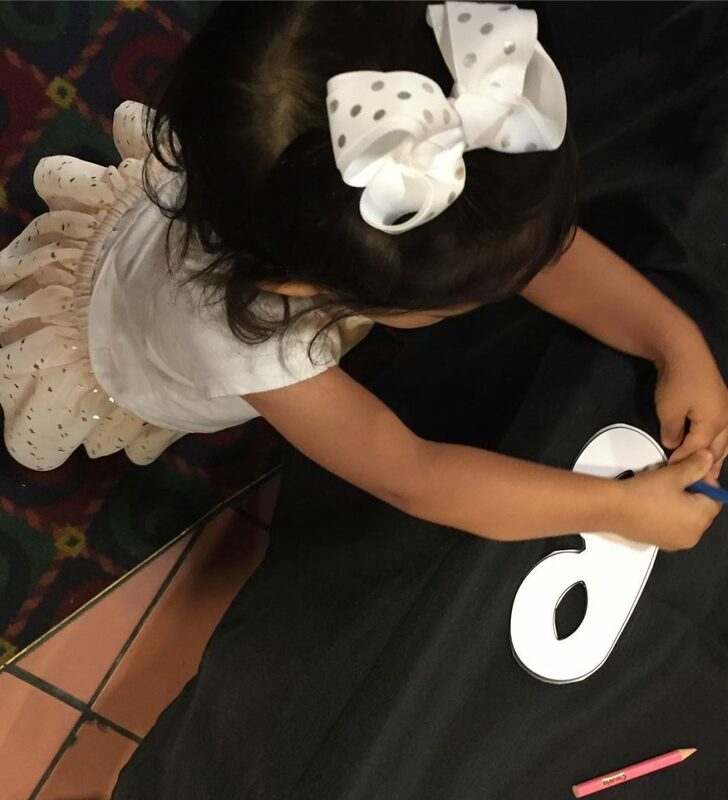 Her other toddler cars could also be decorated in theme for the party so the other children can also ride them together with Alessandra. I blew up extra balloons for the kids to play with. 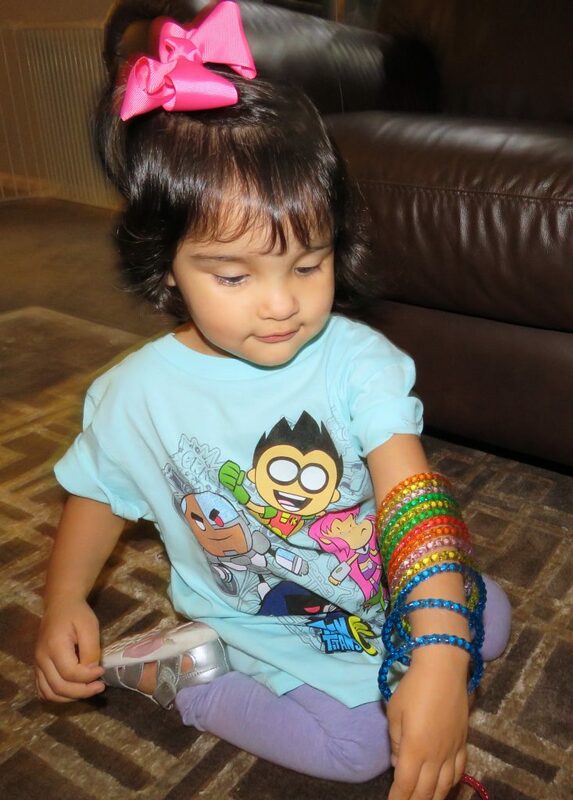 She likes wearing and playing with bracelets, so I knew these would be a hit! 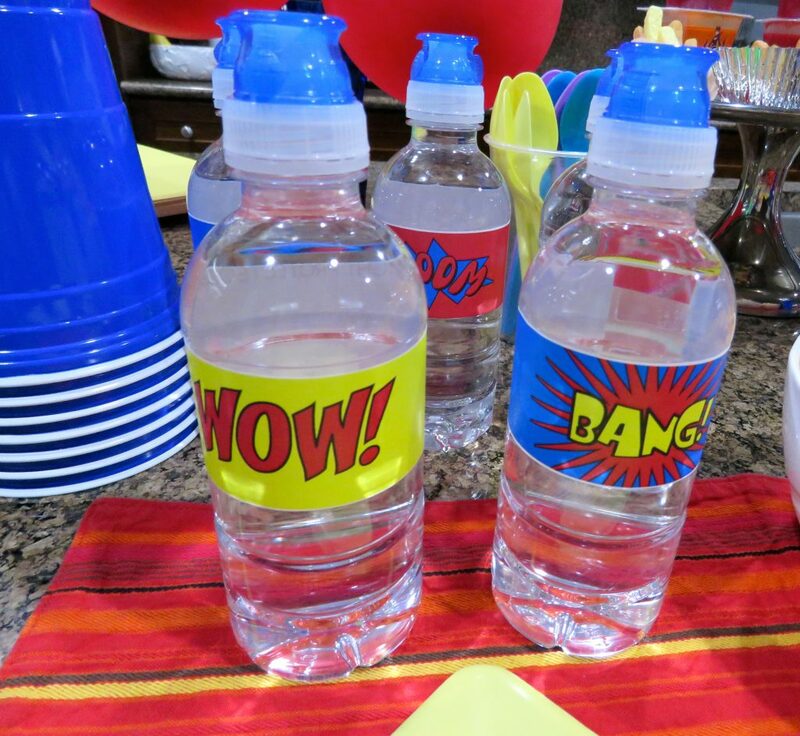 The bottled water superhero labels are available for free at PartyDelights.com. These can also be used as napkin rings and to decorate other items. 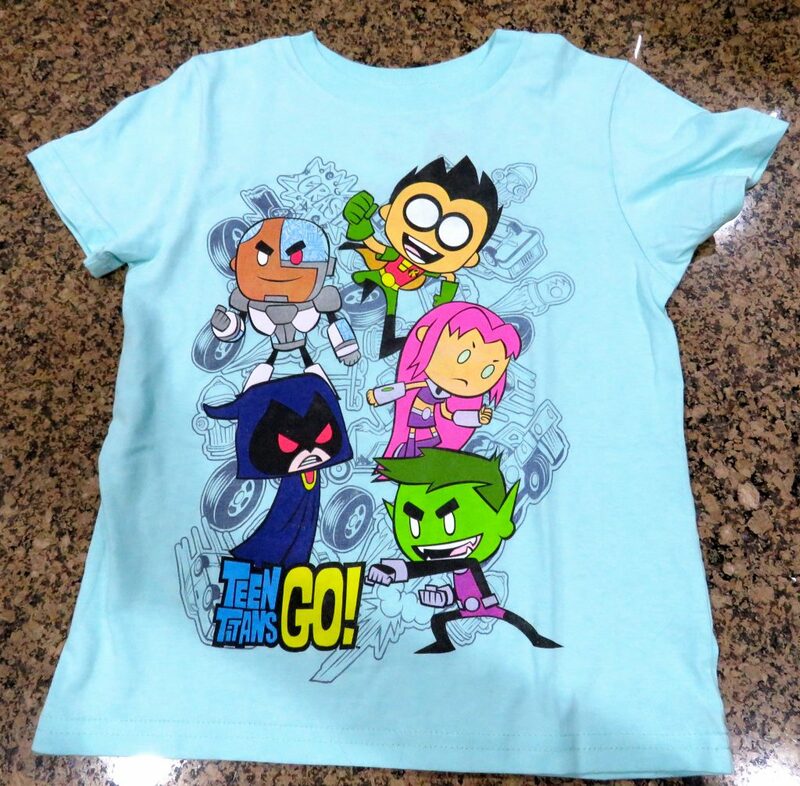 A Teen Titans GO! T-shirt for Alessandra, at Target. Superhero sticker pad at Target (in the card & stationary section). LED light balls and rings, and colorful blowers, at Target. 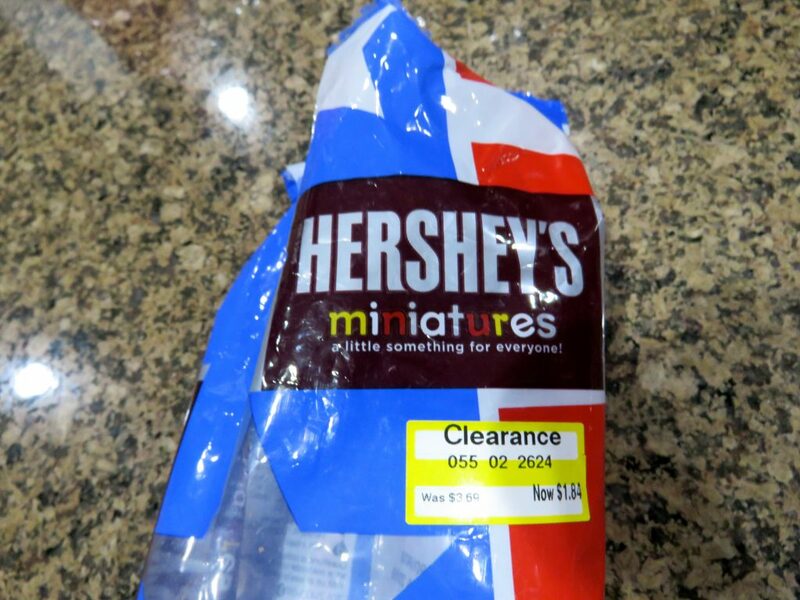 These Hershey’s miniatures chocolates in red, white and blue, with stars (& going with the superhero theme colors) were on clearance at Target (perhaps left over from 4th of July items). The cape, at Party City. They had capes available in multiple colors. 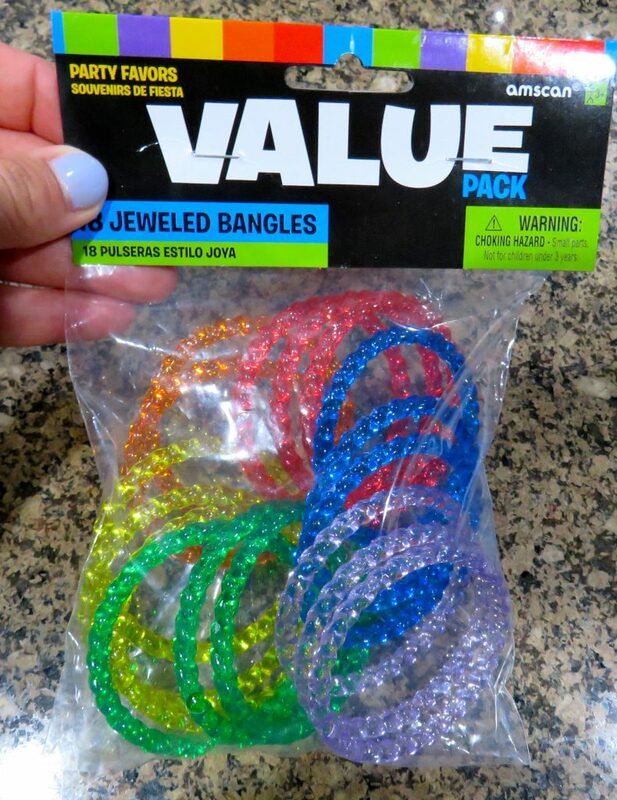 Colorful bracelets for children, at Party City. Theme colored masks, at Party City. They also had other colors available. 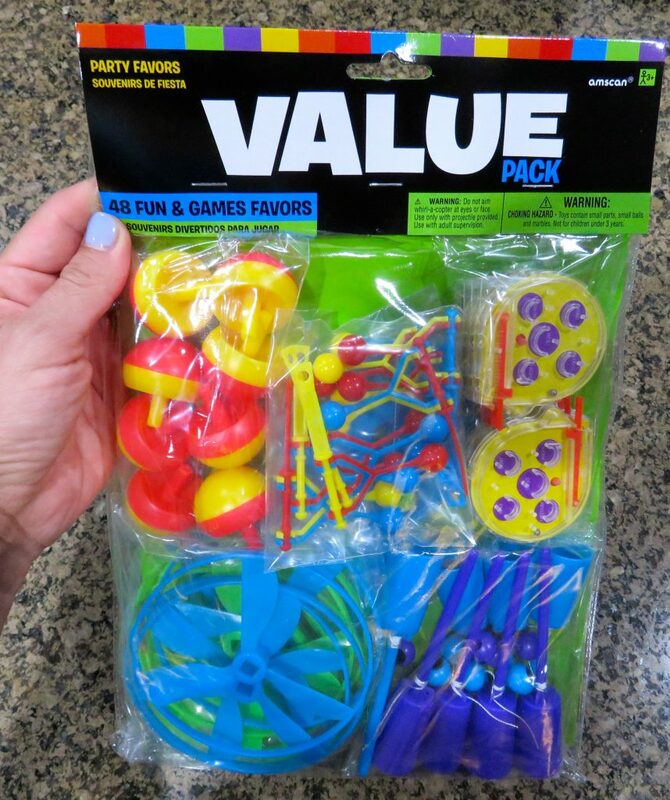 Fun & Games Favors package at Party City. 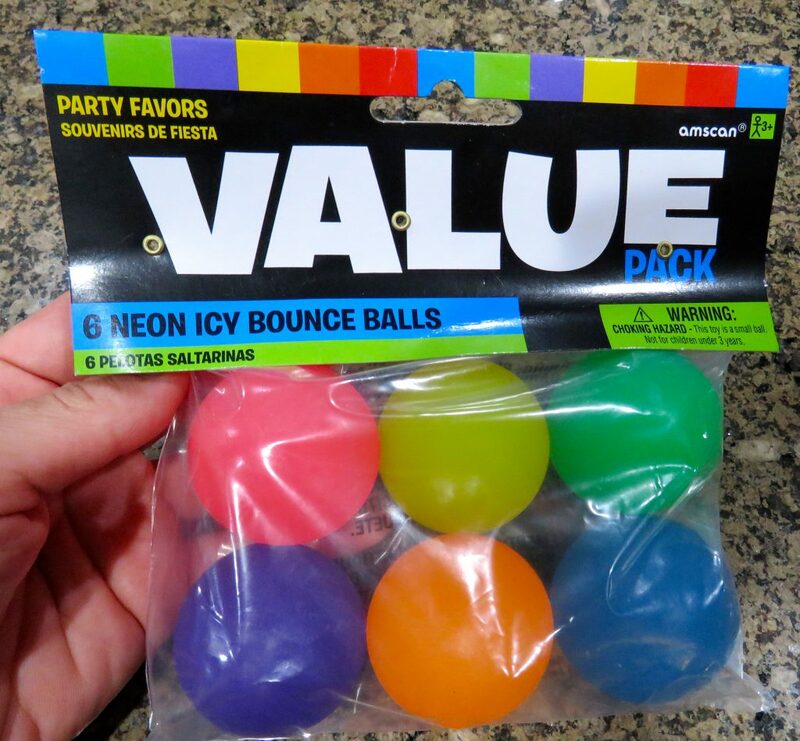 Neon Icy Bounce Balls pack at Party City. 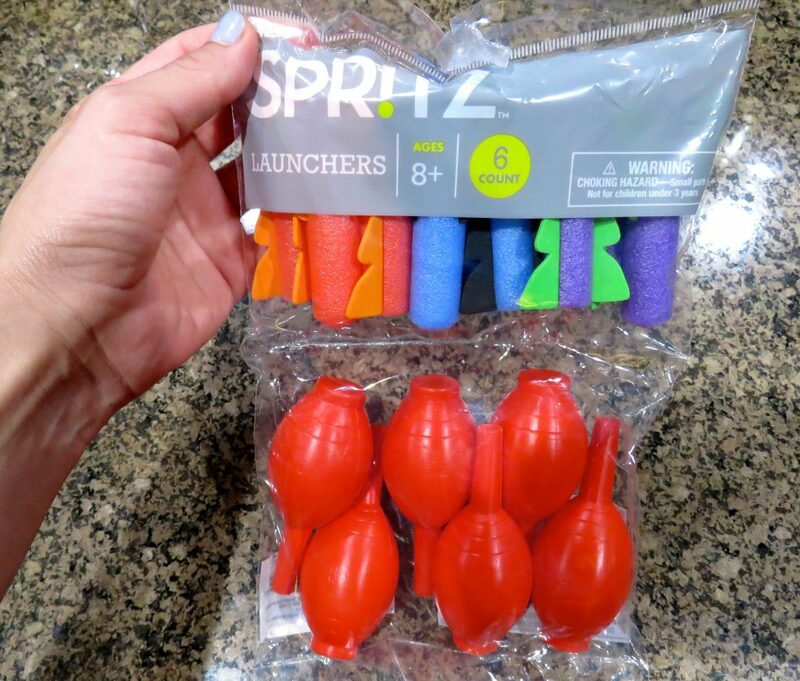 Package of launchers, at Target. I used flexible straws to hold up the balloons and placed them in small flower vases. 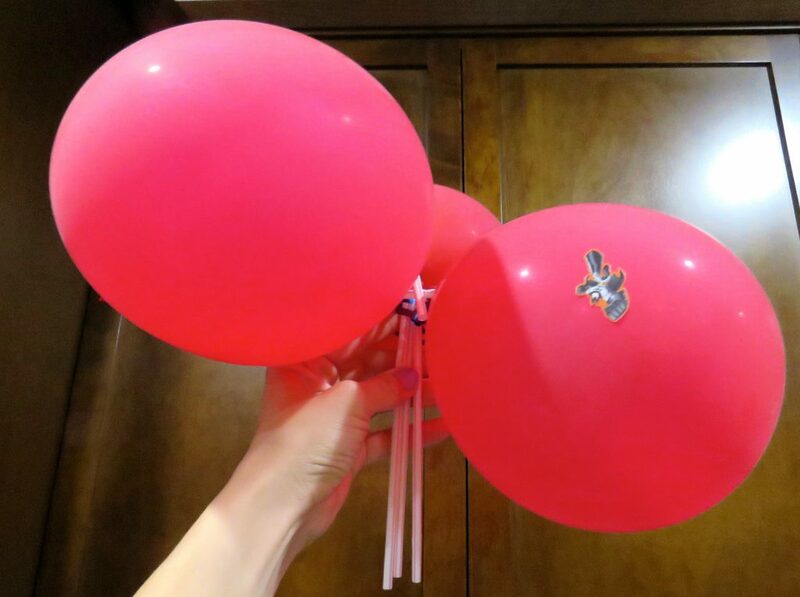 I attached the straws when I made the knots to seal the balloons. I tied the three balloons together by the straws with blue ribbon. 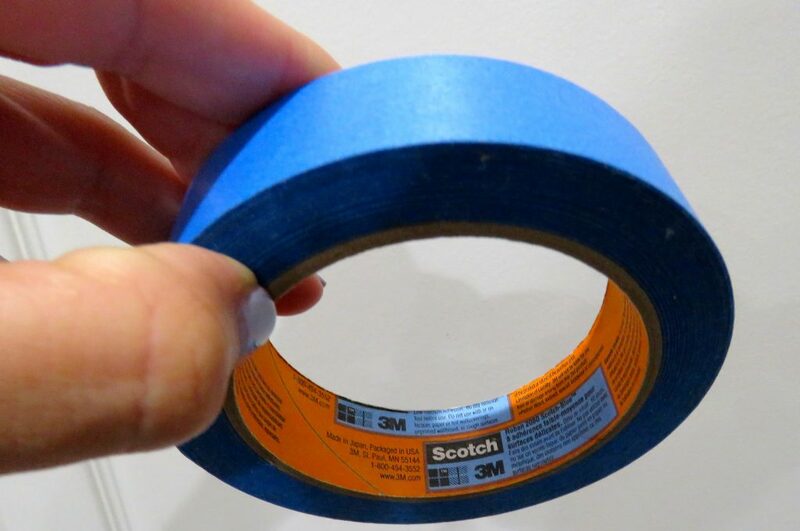 This is the painters tape I used for multiple do-it-yourself decorations and the game. 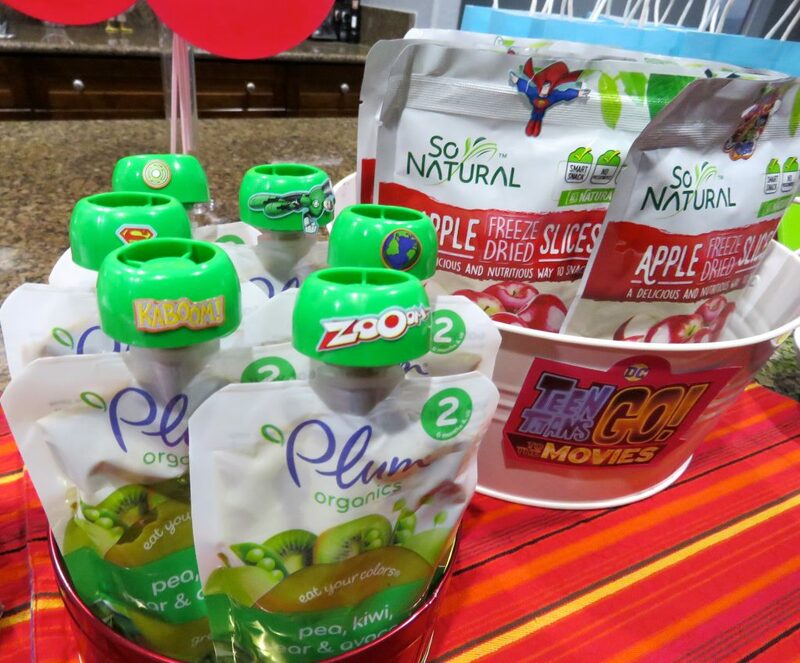 It is easy to cut and does not damage the items I used it for, such as attaching the theme labels the containers for the food. 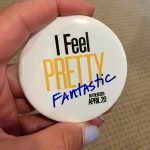 This entry was posted in Entertainment, Lifestyle, Videos and tagged DIY, Entertainment, films, Motherhood, Movies, Party Themes, Superheroes, Teen Titans Go! To The Movies by phjiao. Bookmark the permalink.